You could have a face as pretty as Aishwarya Rai’s and a personality as charming as, well, let’s say, Aishwarya Rai’s, but we are all slaves to our cultural habits – we like to fixate on one minor flaw rather than celebrating the goodness. This is why, a broken tooth may become a deal breaker in you life. You can hide it behind sealed lips, but how long can you go without smiling? At Dr Gowds, we take pride in mending even the minor issues which hold the potential of breaking major deals. 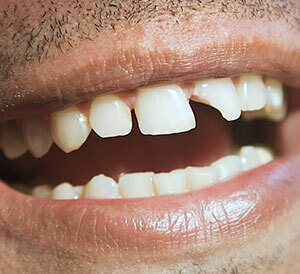 Broken Tooth: In simple terms, a broken tooth or a chipped tooth is one which is broken. A healthy tooth consists of 3 layers – enamel, dentin, and the pulp. The pulp of the teeth contains nerves and blood vessels of the tooth. When the enamel (the outermost layer) gets cracked, chewing can cause irritation to the pulp. A crack in the tooth may look like a minor hairline fracture, which usually runs from upper end to the bottom of the tooth. Sometimes these cracks are not visible to the naked eye. Craze lines: As you age, you might develop craze lines on your teeth. It is a minor damage to your enamel and is very common in adults. Craze lines pose no threat to Dental health. But they can be highly unpleasing when it comes to aesthetics. Fractured cusps: Sometimes, a portion of your tooth falls off with no apparent notice and no pain whatsoever. This is because that portion of the teeth has grown weaker over time. A dentist could have foreseen the condition. If the chipping is too severe, a Root canal might be in order. Cracked teeth: The ‘crack’ in a cracked tooth starts at the top and gradually spreads deeper if left untreated. If the crack goes till the pulp, it’s called a split tooth. A split tooth cannot be saved. Vertical root fractures: Vertical root fractures is the opposite of cracked teeth. Here the split starts from the root and develops up to the Crown. You experience a sharp pain while you bite or chew. You have tooth sensitivity with very hot, cold or hard food items. You had a mouth injury or loss of tooth structure due to a large area of Decay or filling. You have uneven chewing pressures, or a habit of teeth grinding.